I've been enjoying SP RAMDisk for some months now. My ram disk is used to store temp stuff and I'd like it to be emptied when I shutdown or restart the computer. However, on Windows 8.1, this only happens if I restart the computer. If I shut it down, when I turn it on, every file and folder is back to the ram disk. This means they were stored on my SSD during shutdown. This is exactly what I want to avoid: unnecessary writes to my SSD. It's an NTFS, boot-time, removable disk. I tried changing to NTFS32 and non-removable, without success. Any ideas? This is because Windows 8 features a so-called hybrid boot. Even when you shutdown the computer, it is not a real shutdown and Windows preserves the RAM disk's contents. You may want to either disable hybrid boot or do a full shutdown. Thanks for your quick answer and for the alternatives! I thought that would be the reason, indeed. But shouldn't Windows eject removable media before shutting down? Or else, could I run a command from command line to unmount the ram disk before shutting down? You could just use a logon-time RAM disk rather than a boot-time RAM disk. This type of disk will be mounted upon log-on and unmounted upon log-off or shutdown, which may be exactly what you want. Thanks again for your answer. I tried that, but strangely RAMDisk appears to be no longer starting with Windows. It's configured to do so (even task manager says it does start with Windows) and it does create boot-time ram disks. However, it only creates logon-time ram disks if I start it manually. Any ideas? 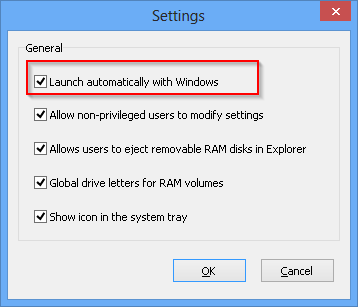 Check this setting in the RAM Disk global setting, perhaps it's unticked? Sorry in that case I have no idea. It could be some antivirus software issue I guess. You can try deleting the existing autorun entry in the registry and create a new one manually (or create a shortcut in the Startup folder). Well thank you very much for your answer Andrew! I really appreciate this solution as this issue have been annoying me for ages now (since starting to use your RAM Disk and trialling Windows 10) ! I would imagine it is well worth adding this tip to your help pages about creating backup image files. I'm sure this will help alleviate confusion with many people that do not yet know about Hybrid Boot on Windows 10 or even 8. Leading up to finding this thread I must say I am very impressed with the speed of effective official responses to the many threads here. A lot of companies would do well to emulate such excellent caring service. This problem was caused by WINDOWS 8.1 fast boot. Disable fast boot and everything will be ok! !